In 1904, during his first military assignment in the Philippines, Lt. Douglas MacArthur, son of Arthur, befriended Manuel Quezon, a well-educated Chinese mestizo, who quickly recognized the plundering patterns being exhibited by yet another imperialist power. Quezon was then prosecuting attorney for the new U.S. colonial government and later governor of his native province, Tayabas. 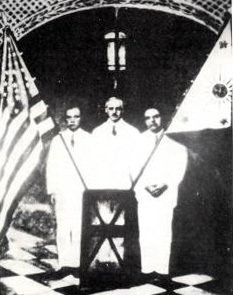 With the American's blessings, Quezon and Sergio Osmeña became leaders in the right-wing Nacionalista Party (though Quezon would later oust Osmeña).6 For the prosperous Philippine minority, democracy, ethics and justice for their less fortunate fellow citizens was trumped by the quest for personal power and profit. From 1919 to 1922, Douglas MacArthur served as superintendent of the U.S. Military Academy at West Point. He was then sent back to the U.S.-occupied Philippines, where he would be stationed until 1930. Between 1928 and 1930, he served as commander of the Philippine Department, a regular US Army unit devoted to training Filipino troops to defend their country. MacArthur returned to the U.S., where President Herbert Hoover promoted him to four-star general and appointed him to the office of Army Chief of Staff, a position he held from November 21, 1930 to October 1, 1935. On July 28, 1932, MacArthur revealed his loyalties to the government's upper management when his men, along with six battle tanks, fixed bayonets and poisonous Adamsite gas (developed by Roger Adams for use in WWI), marched on and fired upon the Bonus Army, a desperate group of World War I veterans and their families (43,000 individuals) who had set up temporary housing which the troops burned. They had been attempting to collect the bonus promised to veterans by the government (which delayed these payments until 1944). Hundreds of veterans were injured and several were killed by MacArthur's troops. Virulent anti-Communist MacArthur claimed that the veteran's group had been taken over by pacifists and communists (the latter serving as America's latest fear-producing, made-to-order enemy). Hoover later helped force the resignation of America's most decorated general, Smedley D. Butler, who supported the objectives of the Bonus Army. Butler vociferously maintained that war is a racket to enrich big business. An opponent of pacifism, Douglas MacArthur, pursuing political ambitions of his own, did whatever it took to oblige his superiors. He would officially retire in December 1937 but remained on the active duty list. In the fall of 1934 President Quezon had visited MacArthur in America to inquire whether he could resume supervision of the Philippine Army, due to the acceleration of Japanese aggression in Asia. Though MacArthur would have preferred to be the Commonwealth's Governor-General, he consented and was commissioned Field Marshal of the Philippine Army, a position created just for him, complete with a lavish salary and other amenities. With Quezon's encouragement, MacArthur also designed his own uniform - black pants, white tunic, a braided cap, a gold baton and enough medals, stars and gold cord to impress the most unimpressionable person. Quezon built MacArthur a luxurious penthouse with a spectacular view of Manila Bay atop the Manila Hotel. He was inducted into the most exclusive clubs, including Quezon's assembly of Freemasons. He became a director for the posh Manila Hotel and received generous shares of Benguet Mining stock. Meanwhile, he neglected his military responsibilities. He was originally responsible for maintaining twenty-two thousand American and eight thousand Filipino soldiers in combat readiness.9 By November 30, 1941, MacArthur commanded only 31,095 men, including 11,988 Philippine Scouts. The Philippines was a U.S. territory from August 13, 1898 to November 15, 1935, when the U.S. granted the islands a degree of autonomy through the Tydings-McDuffie Act by making them a Commonwealth and allowing them to develop a constitution which was signed by Franklin D. Roosevelt on March 23, 1935. Full independence was to be granted after a ten-year transition period. But all of this changed with the Japanese invasion, followed by yet another profitable, calculated catastrophic world war. Japan's naval strength had increased during World War I to five fleets - these ships had been acquired from British firms, and paid for with loans from Rothschild-controlled British banks. Before World War I erupted, the U.S., Germany, Britain and Japan competed to acquire colonies in the resource-rich Pacific Rim with an abundance of industrial metals like manganese, tungsten, antimony, tin, nickel, and chromium. Japan had invaded and annexed Taiwan in 1895. They had invaded Korea in 1895 and annexed it in 1910. Germany had leased land in China's Shandong Province in 1898 and then purchased the Marshall and Caroline Islands from Spain in 1899.12 Influential U.S. companies and banks had industrial interests in China and the Pacific, including the Philippines. The U.S. had forcefully annexed the Hawaiian Islands in 1898 on behalf of wealthy American sugar producers as described in part ten of this series. Herbert Hoover attended portions of the Paris Peace Conference which opened on January 18, 1919. Fifty individuals attended another meeting that was held at the Hotel Majestic in Paris on May 30, 1919, the organizational meeting of an Anglo-American Institute of International Affairs, which had one branch in London and one in New York called the Council on Foreign Relations (CFR). Col. Edward M. House and his advisors, Herbert Hoover and Thomas W. Lamont, were among the twenty-one American attendees, including twelve scholars from Harvard, Yale and Columbia. The financing for the creation of the CFR came in part from J.P. Morgan, John D. Rockefeller, Bernard Baruch, Otto Kahn, Jacob Schiff and Paul Warburg.13 Hoover accompanied banker Bernard Baruch, to Paris (Baruch would later be instrumental in the Wall Street Crash of 1929.) In 1922, as a result of the Versailles Peace Treaty, Japan was limited to about two-thirds of the fleet allowed the United States and Britain. This was viewed by the Japanese as racist and inequitable. Lamont was a J. P. Morgan Partner and chaired its Board as of March 1943; he owned the New York Evening Post from 1918 to 1922 (its current owner is media mogul Rupert Murdoch); and he was the representative of the U.S. Treasury in the American delegation to the 1919 Paris Peace Conference.16 Members of the U.S. chapter of the Pilgrims Society lobbied for U.S. involvement in World War II on the side of Great Britain. To implement fascism in Italy, Lamont arranged a $100 million loan to Mussolini in 1926 - leading Wall Street bankers were/are very supportive of all fascist regimes. Japan had been warring against China since 1931. Germany, after invading Poland on September 1, 1939, was at war with Great Britain and France. The U.S. had been monitoring Japanese communications since the early 1920s.18 By August 1940, America could de-code all of Japan's messages. The war was raging in Europe and America's leaders were endeavoring to get America embroiled in it despite what her citizens wanted. Presidential candidate Roosevelt had promised neutrality if re-elected. Insiders knew better! If an opportunity did not present itself, Roosevelt was going to create one. In August 1940, while promising neutrality, the National Guard was assigned federal service for a period of one year. Additionally, the Selective Training and Service Act of 1940 (a peace time draft), known as the Burke-Wadsworth Act, was passed by Congress on September 14, 1940. Coincidentally, on September 27, 1940, Japan, Germany and Italy (the Axis Powers - all fascist) signed the Tripartite Treaty in Berlin, a military alliance, which stipulated that if any one of the three nations was attacked by any of the Allied nations (Great Britain, United States and the Soviet Union), then all three of the nations would be at war. The feasibility of Germany attacking the U.S. was zero. If the U.S. responded to a Japanese attack, the U.S. would also be drawn into the European War, just what the profit-seeking bankers wanted. Roosevelt and Winston Churchill (PS), a Rothschild minion, had already covertly committed to engage in a war against Germany. During his presidential campaign, Roosevelt had promised American mothers and fathers that he would keep their young men out of an irrelevant foreign war. However, an attack on America would change everything. At Roosevelt's request, in October 1940, Secretary of the Navy asked Admiral J. O. Richardson, Commander-in-Chief of the American fleet in the Pacific, to position American naval ships across the Pacific Ocean in order to prevent Japan from obtaining crucial supplies. Richardson protested against this obvious act of war. Perhaps Richardson was being set up as a patsy? Richardson had requested that his fleet, inadequately prepared for war, be withdrawn from Hawaii, where they were totally exposed and vulnerable. Those requests were ignored! Richardson was suddenly relieved of his command in January 1941. On July 26, 1941, Roosevelt recalled MacArthur to active duty in the U.S. Army and assigned him as Commander of U.S. Army Forces in the Far East (USAFFE), promoting him to lieutenant general. The entire Philippine Army, including Ferdinand Marcos, was inducted into the U.S. Army. Despite military records to the contrary, Marcos would later claim to have shown extraordinary courage and to have performed life-saving heroic exploits; these claims were promoted by his hired biographer, and later validated by Lyndon Johnson when he needed support for America's invasion of Vietnam. Presidential foreknowledge about the imminent attack on Pearl Harbor has been well substantiated through recently-released public records. Over 2400 individuals were literally sacrificed to get the U.S. into war in the Pacific and in Europe. ^ Kansas History as Published in the Press February, 1940 (Vol. 9, No. 1), pages 106 to 109, Transcribed by lhn; digitized with permission of the Kansas State Historical Society. ^ An Introduction to the "Little Sister" of The Royal Institute of International Affairs: The U.S. Council on Foreign Relations By Eric Samuelson, J.D. ^ Pearl Harbor, the Mother of All Conspiracies..., op. cit.